best jig fishing action found anywhere in the Great Lakes region. On March 8th, Robert wrote - Saw your first (?) early 2016 show on 2015 Detroit river, excellent coverage. Can't remember bait specifics. Can you tell me the Jig sizes (weights) required. With those currents I suspect them to be 1/2 oz. and above. What were the jigs you used, (unique shape) and manufacturer. Finally what plastic baits were you using and the recommended colors. This info will help me plan for my 1st crack at this fishery. of keeping the hook upright so snags are reduced and fish are hooked clean in the roof of the mouth. Our best color were the Chartreuse/Green models. We tipped those jigs using a local soft plastic called the Wyandotte Worm, which is little more than a four inch finesse soft plastic worm. Brown was our best color Wyandotte worm. We also tipped with a shiner minnow. The minnow is optional and one a good day when the bite is solid, most guys don’t bother with the minnow. That show was filmed around April 6 and generally speaking the best fishing for big walleye is in early April when the water is still cold. 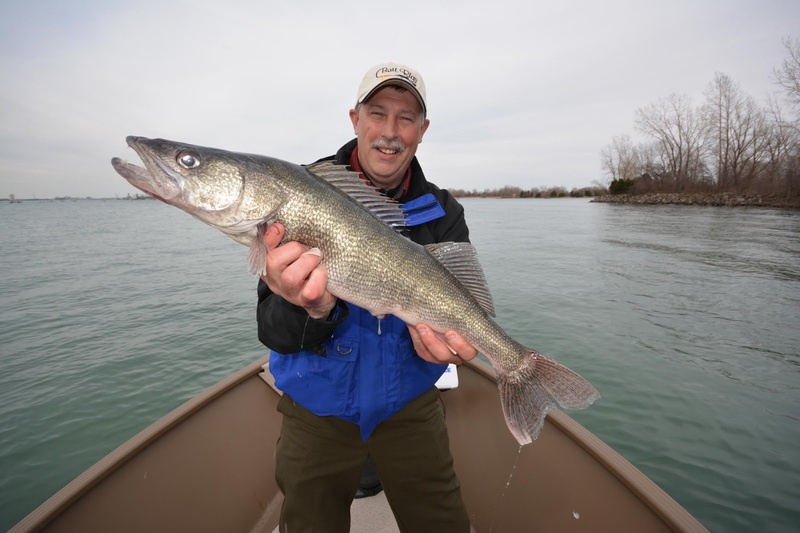 Later in April the bite is still good, but a higher percentage of the bites are from smaller male walleye. Both the Michigan and Ontario sides of the river have their days. 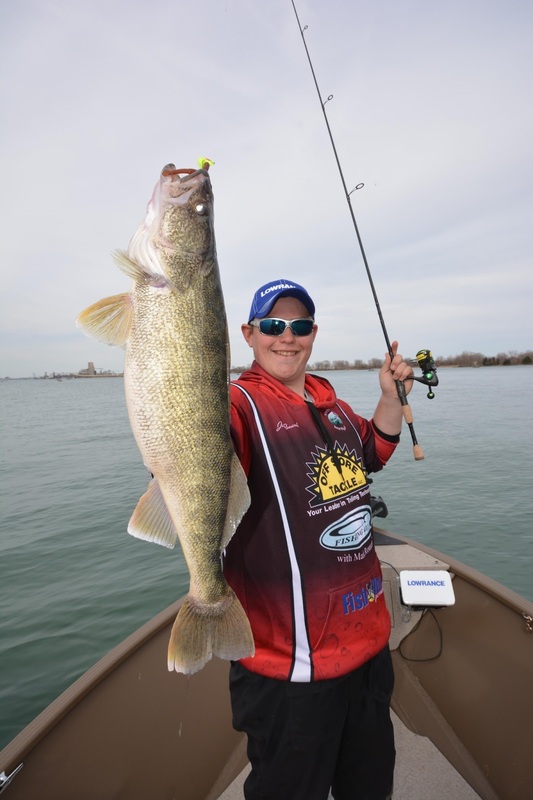 Ontario enforces a one rod rule, while Michigan you can have three lines per angler. Many guys on the Michigan side will be jigging with two rods at once. We launched at the Wyandotte municipal launch, but it is a popular spot and often crowded. Plan on waiting in line at least 30 minutes or longer on weekends. Thanks Robert for watching Fishing 411. Good luck on the Detroit River. Watch for us, because Jake and I will be back at it again soon.